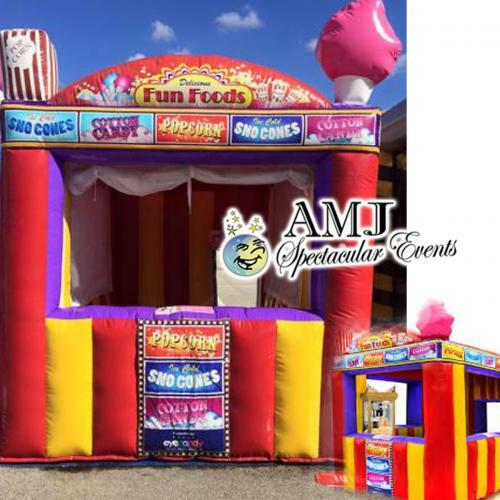 Serve your guests in style with our inflatable concession stand! Watch your guests� eyes light up as they approach this fun stand that has the option of being ran out of 3 of the 4 sides. This concession stand has different options to make it the perfect fit for your event. If you are using this stand outside, the three windows have the option to have the mesh covering the window to protect your food from bugs. Want to hang and showcase specific treats such as cotton candy or popcorn bags? Our concession stand features metal D rings to help you hang your items with ease! Our inflatable concession stand is the perfect addition to your next fundraiser! As the centerpiece of your event, guests to will be drawn to the windows to see what treats and sweets you have to offer! Fun fairs, sporting events, fundraisers, block parties, birthday parties, and corporate events...our concession stand is the perfect addition to your event! Let AMJSE take care of all the work - we will deliver, set-up, and take down your concession stand, so all you have to do is enjoy! Contact us now to talk about this, other fun games, or about the hundreds of other rentals we have ready to help make your party a spectacular event!